Page Street Publishing, 9781624142482, 192pp. What’s better than 30-minute meals? How about one-pot recipes? Now you don’t have to choose—yes, you can have both! Avoid spending hours in the kitchen and filling up your sink with dirty dishes. Soon to become a staple in your kitchen, 30-Minute One-Pot Meals provides practical and ingenious secrets to simple, fast, delicious and minimal-mess recipes. Chapters are broken down by cooking vessel, including baking pan, saucepan, skillet, casserole dish and more. In less than 30 minutes you could be devouring Mediterranean Chicken Pesto Pizza, Parmesan Orzo Risotto with Peas or Easy Cheesy Cauliflower and Broccoli Bake. These versatile and easy-to- follow recipes aren’t just for dinner—endless possibilities for breakfast, lunch and dessert are all included as well! 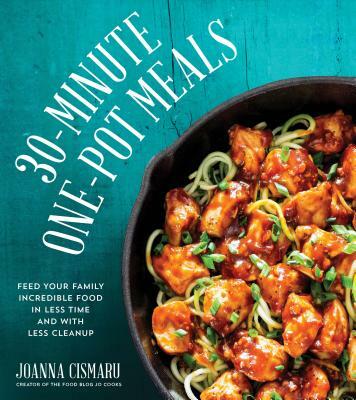 30 minutes and one pot is all it takes, and in this book Joanna Cismaru shows you how. JOANNA CISMARU is the founder, writer and photographer of the popular cooking blog Jo Cooks. She lives in Calgary, Canada.